Thursday. We are back from Spiceworld and have all had way too little sleep. We are exhausted. Thank goodness today ended up being super slow at work so I was able to get some time to recover. I slept in a little this morning, but not much as there was work needing me. But it wasn’t too busy. Rachel had to go work a bit, but came over later on in the day. Bohdan had to get to the airport this morning to fly to Dubai, and then on to Kuala Lumpur where he is going to be for a few weeks. We are hoping that he comes back to Dallas to visit in May. I took an afternoon nap, not very common for me. That is a once or twice a year kind of thing, at best. I didn’t sleep a lot, but an hour or two and it made all of the difference. Having worked or slept through breakfast or lunch, I was hungry by late afternoon. Rachel had not eaten either. So we decided to go get lunch as we were both in the mood for fish tacos and Dominica and Paul were on a completely different schedule and had already eaten. Rachel and I went up to Rockfish in The Colony. She has never been there before, and it is one of my favourite places to go to eat. We were both really hungry and wanted to try several things, so we decided to just get one order of Santa Fe fish tacos and split it, split the volcano shrimp, split some rice, some jalapeno hush puppies, and some cheesy grits. We were pretty funny splitting everything. The only thing we didn’t split were our drinks; she likes a frozen margarita and I like a hurricane. Rachel really liked the food and we both decided that are strategy was perfect, we each got the variety that we wanted and more than enough food and we only needed one appetizer and one main course to completely fill us. It was so nice, we had decided to sit outside. A perfect day for relaxing on a Dallas patio. We did split one house beer before leaving, as she is a “beer collector” and had never had their in house beer before. Next door to Rockfish is a cool beer pub called Lonestar Taps and Caps. Rachel has been there before and loves it; it was new to me. So we went there for one flight before calling it a day. The beer selection was incredible. I like this place a lot. 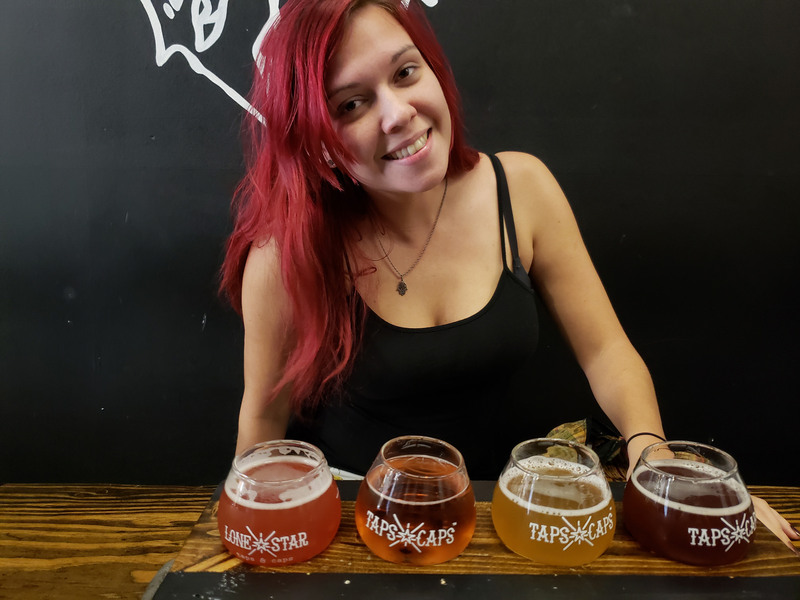 Rachel with her beer flight. Rachel with both beer flights. 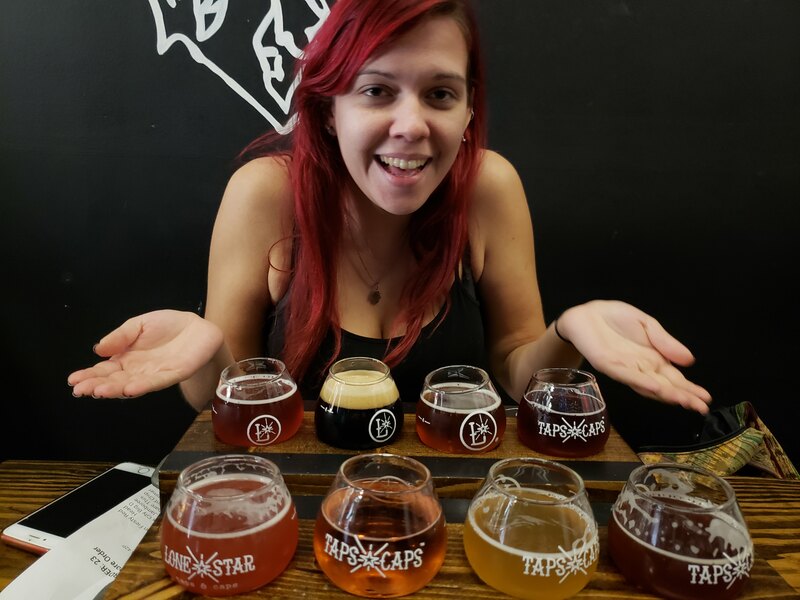 We had a great time trying and reviewing the beers. It was a really nice afternoon out. Really, it was more of an evening outing. After dinner was nearly done I had realized that it was nearly four o’clock local time, so the work day was really over for us. Which was perfect, so I did not have to worry about work stuff. Extra good since my phone died while we were trying the flights, so I got a good hour offline, too. Got home around six thirty or seven. Rachel took off to go back to her grandmother’s so that she could do laundry and stuff. She is heading down to Austin tomorrow for Anita’s 21st birthday party. Coming back on Sunday, I think. I am scheduled to go to Portland next week. Going on Monday, returning on Thursday. This evening was just relaxing at home. Some Growing Pains, some reading. We finished reading Harry Potter and the Chamber of Secrets tonight as the girls and I do our second full run through of all of the Harry Potter books together. Harry Potter with my kids is analogous to my mom reading me the Chronicles of Narnia books. Speaking of which, I think it is time to read those with my girls once again. We read some of them back when we lived in Peekskill, so likely in 2014. Luciana does not remember them at all. Liesl remembers them but only vaguely. Early to bed tonight. I am feeling much better and am mostly caught up from the week in Austin.